Good to see bus passengers being told just where they stand in one of Bristol’s premiere shopping centres. 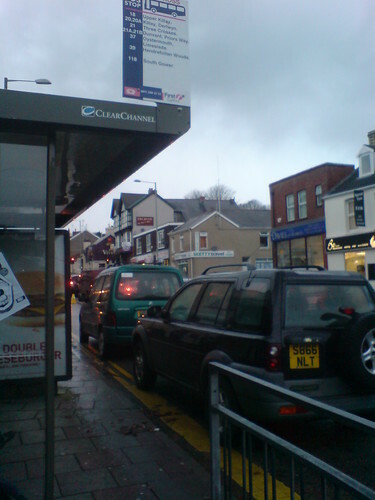 Over in Swansea, too, the car → driver → bus → passenger heirarchy is rigidly enforced. A couple of weeks ago, while waiting with Alex for the 118, this bus parking area in Sketty was permanently occupied by a stream of cars using the new Tesco Express. The driver of S866NLT kept the engine running while a brave shopping partner visited the outside world — there’s nothing worse than a cold car, and if you’re sad enough to use a bus you’ll probably enjoy exhaust fumes too. » Art attack, Shark attack!